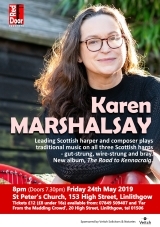 Karen Marshalsay's music draws on a wealth of differing experiences, developed through the folk world of fèisean, festivals, workshops and tuition from leading players such as Alison Kinnaird, and studies with Paraguayan harp master Rito Pederson. Specialising on all three Scottish harps – both gut- and wire-strung models and the baroque bray harp with its buzzing sitar effect – Karen has appeared throughout the UK, Europe, America and Australia. Career highlights include the Edinburgh International Festival, Celtic Connections, the Australian National Folk Festival, and working with African, Indian and Paraguayan musicians and on multi-cultural projects including Yatra, which premiered at the Edinburgh Mela in 2008. With a particular interest in pipe music, Karen has played with Allan MacDonald in his acclaimed pibroch concerts, and for the National Piping Centre’s 2013 Ceòl na Piòba concert. 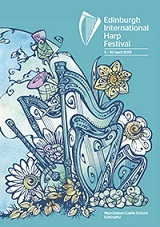 As a composer, Karen had her work performed in 2018 by the acclaimed Russian String Orchestra (Misha's Gang) conducted by Misha Rachlevsky (with Karen as guest soloist), was Composer in Residence with Harps North West in 2016, was commissioned by Celtic Connections’ New Voices series and had her work featured in the Distil showcase concerts. 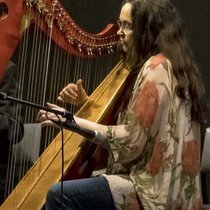 She has published her own series of harp music books, including Key Techniques for Harp in 2012 and for 7 years was clarsach tutor at the National Centre of Excellence in Traditional Music at Plockton, where she received a Distinction in the LTCL diploma, the first person to do so with an all traditional repertoire. She teaches wire harp at the Royal Conservatoire of Scotland and is a guest lecturer for Glasgow University and UHI. As well as solo recitals Karen currently performs with the legendary Irish flute player and singer Cathal McConnell in The Cathal McConnell Trio.